The Wonder Formally Known as Blogless: Semper Fi. I discovered this site last night and thought I would share. 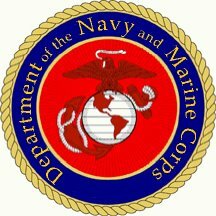 Department of the Navy and Marine Corps. The ideas is a good one; if you support it please sign the petition. What is it you ask? Go check it out. Investigate it for yourself. Also, I know I have been slacking on the latest douchenugget of the week. Working on it. Although Fred Phelps and his b.s. church are still designated until replaced. Carry on.